This is the second of a series of eight lectures, sponsored by A Jewish Voice for Peace. This lecture was videotaped on Oct. 28, 2002. The lecturer is Joel Beinin, a professor of middle east history at Stanford University. Professor of Middle East history at Stanford University. He is currently serving as the President of the Middle East Studies Association of North America, and is also involved with the Middle East Research and Information Project (MERIP) and the Middle East Social and Cultural History Association. The lecture uses two maps. The first is a map of the "Pale of Settlement" in Czarist Russia, which breaks the Pale down into provinces shaded by Jewish population percentage. The following is a different map of the same territory, which provides better geographical references (e.g., city names) and also provides markers for the major pogroms. This map comes from A Historical Atlas of the Jewish People. The second map shows Zionist settlements in Palestine up to 1914. Note that, in contrast to last session's map, this one shows virtually no Arab towns. This map comes from the Jewish Virtual Library. 1096: Massacres of European Jews during the First Crusade. 1264: Statute of Kalisz of Duke Boleslaw V grants extensive privileges to Jews in Poland. 1290: Expulsion of Jews from England. 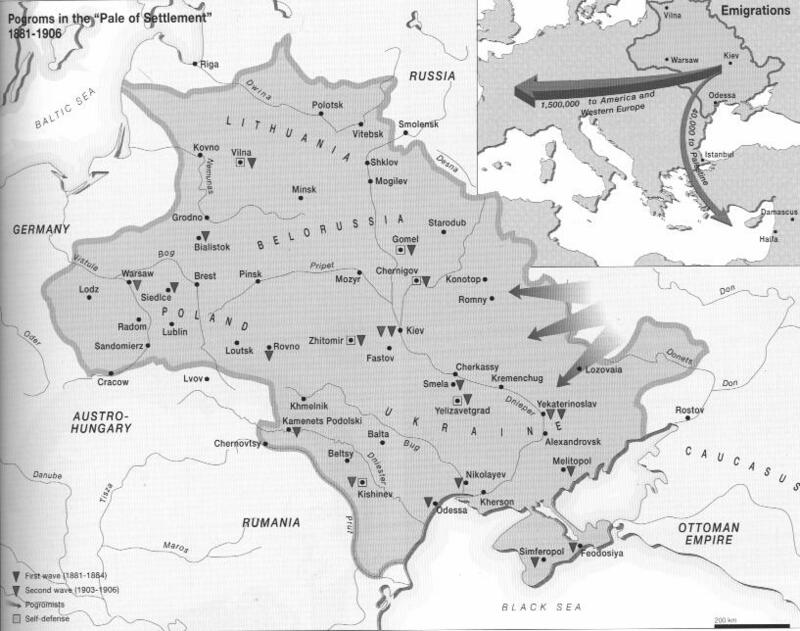 1306: Expulsion of Jews from France. 1492: Expulsion of Jews from Spain; the Inquisition. 1501: Expulsion of Jews from Provence (France). 1519: Expulsion of Jews from Regensburg (Germany). 1569: Expulsion of Jews from the Papal States (Italy). 1765: The Council of the Four Lands and the Council of Lithuania, which allowed Jews in Poland a measure of self-government, abolished. 1791: Emancipation of Jews in France. 1791: Czar Elizabeth II established the Pale of Settlement. 1881: Assassination of Czar Alexander II; many pogroms follow. 1882: May Laws restricted Jews in the Pale to urban areas. Leon Pinsker publishes Zionist pamphlet, Autoemancipation. Founding of first Zionist movement, Hibbat Zion, with first explicitly Zionist emigration to Palestine. 1891: Expulsion of Jews from Moscow. 1894: Alfred Dreyfus charged with treason in France; Emile Zola defends Dreyfus in "J'accuse" in 1895; Dreyfus rehabilitated in 1906. 1903: Kishinev and Gomel pogroms. Fabrication of The Protocols of the Elders of Zion. Great Britain proposes Uganda Plan for a Zionist colony in East Africa. 1905: Russia loses Russo-Japanese War, leading to revolution and a constitution; pogroms in Zhitomir and Odessa. 1913: Beilis trial, rigged by Russian Ministry of Justice to claim that Jews use Christians' blood in their rituals (the old antisemitic "blood libel" charge). 1914: Emigration figures from Pale of Settlement: 2,040,000 to U.S., 115,000 to Argentina, 65,000 to Palestine, 50,000 to Canada, 45,000 to South Africa, 15,000 to Australia. 1916: Zionist socialist movement Hashomer Ha-Tsa'ir founded in Poland. 1917: Russian Revolution. Balfour Declaration. 1918: Zionist Commission, headed by Chaim Weizmann, goes to Palestine to assist British in implementing the Balfour Declaration. 1920: Great Britain is given League of Nations Mandate for Palestine. Sir Herbert Samuel, a well-connected British Jew who lobbied extensively for the Balfour Declaration, becomes first High Commissioner of Palestine. Population: The Jewish population in the Pale of Settlement grew from 1.6 million in 1820 to 5.6 million in 1910. From 1881 to 1914 two million Jews emigrated from the Pale of Settlement to the U.S.
Aliyah: "ascent": a term commonly used in Jewish religious practice, applied to successive waves of Zionist immigration: e.g., the First Aliyah (1882-1903), Second Aliyah (1906-14), Third Aliyah (1919-23), Fourth Aliyah (1924-28), Fifth Aliyah (1929-39). Ashkenazi: the Jewish culture formed in southern Germany during the middle ages; Ashkenazi Jews spoke Yiddish (based on Low German), and spread throughout Eastern Europe from the 10th century, soon outnumbering older Jewish communities. Balfour Declaration: in 1917, while WWI is in progress, Great Britain promises to support the creation of a "Jewish homeland" in Palestine. Basel Program: adopted at the first Zionist Conference in 1897, states "The aim of Zionism is to create for the Jewish people a home in Eretz Israel secured by law." Biluim: the first Zionist settlers, who left Kharkov in 1881 for Palestine. Blood Libel: an antisemetic assertion that Jewish rituals involve drinking the blood of killed Christians. These first appear in the middle ages and continue up through the Beilis affair in Russia in 1913. Bund: "General Union of Jewish Workers in Lithuania, Poland, and Russia": a socialist party, autonomist and anti-Zionist, founded in 1897. Dunam: a unit of land, commonly used in the Ottoman Empire; approx. 1/4 acre. Eretz Yisrael: "Land of Israel": the Zionist term for Palestine before the establishment of modern Israel. Haganah: "defense": the main self-defense organization of the Zionist community in Palestine during the British Mandate. Hashomer Ha-Tsa'ir: Zionist socialist movement, founded in 1916 in Poland. This is the group that Joel Beinin belonged to for ten years. Haskalah: "enlightenment": a movement for spreading modern European culture among Jews from mid-18th through late-19th centuries. In general, the movement promoted assimilation, but it also (perhaps because of its anti-Yiddish bias) led to the Hebrew revival. Hebrew: ancient language of the Jews. From 1750 there was a revival of Hebrew as a modern language, although this did not become widespread until its adoption by the Zionists in Palestine. Hibbat Zion: "lovers of Zion": Russian Zionist group, sponsored first modern Zionist settlement in Palestine in 1882. Histadrut: Jewish Labor Federation in Zionist Palestine, founded in 1920. Irgun Zeva'i Le'ummi (IZL): "military national organization": right-wing Zionist military organization during late British Mandate. Led by Menachem Begin. LEHI: acronym for Lohamei Herut Israel ("Fighters for the Liberty of Israel"), a right-wing military organization. Also known as the Stern Gang. Yitzhak Shamir was a leader. Mandate: a charter from the League of Nations giving a country responsibility to administer and develop a former colony. Great Britain held a League of Nations mandate for Palestine from 1920. Mapai: Israeli Workers Party: David Ben Gurion's social democratic party, the main political party of Labor Zionism. Mapam: United Workers' Party, the left-wing of the Labor Zionist movement. Ottoman Empire: founded by Turkish clan leader Othman in the early 14th century, the Ottomans established a power base in what is now Macedonia, from which they conquered Constantinople (Istanbul) in 1453, and eventually expanded a multinational empire that circled the Black Sea, stretched from the outskirts of Vienna to Yemen, east to Persia, and west along the north coast of Africa to Algeria. While the Empire was nominally Islamic and incorporated the Muslim Caliphate, it provided substantial autonomy for Christians and Jews, and willingly absorbed most of the Sephardic Jews expelled from Spain in 1492. The Empire declined, especially after 1800 as European powers (especially Russia) expanded into its territories and exploited rebellions in the Balkans, and forced the Ottomans to accept "capitulations" which gave the European powers extraordinary rights to operate in Ottoman territory. The Ottoman Empire fell in WWI, followed by a retrenchment of Turkish nationalism under Kemal Attaturk, which left the predominantly Arab parts of the Empire under European control. Pale of Settlement: a block of 25 Russian provinces which Jews were allowed (or restricted) to live from 1798-1917. Palmah: an elite unit of the Haganah. Pogrom: Russian for "thunderstorm": mob violence against Jews, usually with state support. The word was first used to describe acts against Jews in Odessa in 1871, although it is now commonly used for all similar incidents. Uganda Scheme: a plan proposed by the British government for an autonomous Jewish colony in East Africa. Rejected by the World Zionist Congress in 1903. Yiddish: language spoken by Ashkenazi Jews in Central and Eastern Europe from about 1000; based on Low German, incorporating words from Hebrew and other sources. Yishuv: "settlement": the Zionist community in Palestine in the pre-state period. Zion: one of the hills of Jerusalem. Ahad Ha-Am (Rabbi Asher Ginzburg) (1856-1927): a Rabbi from Odessa, who toured Palestine in 1891, and wrote essays prophetically warning of future clashes between Zionists and Arabs in Palestine. Active in Hebrew revival. Considered to be a "cultural Zionist" -- more interested in using Palestine to develop worldwide Jewish culture than to seize political control. Czar Alexander II (1818-1881): Russian Czar from 1855 up to his assassination in 1881, which preceded a number of pogroms. Early in his reign he sought peace in the Crimean War and ended serfdom in 1861, but he also pursued intense Russification throughout the empire, waged a series of wars against the Ottoman Empire, and was ruthless in suppressing radical movements. Alfred Dreyfus (1859-1935): Jewish colonel in French army, accused of treason to explain French loss in Franco-Prussian War (1871). The Dreyfus Affair was a notable incident of antisemitism in relatively enlightened Western Europe (France was the first modern nation to emancipate its Jews). Exonerated in 1906, many years after the affair started (1894). A.D. Gordon (1856-1922): a founder of Labor Zionism, likened to Leo Tolstoy, believed in "a gospel of manual labor." David Ben-Gurion (1886-1973): leader of Histadrut and Mapai, from early 1930s the main political leader in the Yishuv; directed Haganah in Israel's 1947-49 War of Independence, becoming first Prime Minister of Israel. David Hacohen (1898-1984): a leader in the Histadrut. Quoted by Beinin. Theodor Herzl (1860-1904): major Zionist theoretician, from Vienna, who wrote The Jewish State in 1896, in response to the Dreyfus Affair. Vladimir Jabotinsky (1880-1940): early right-wing Zionist leader and theoretician; author of "The Iron Wall"; leader of Revisionist Zionism, which eventually leads to today's Likud party. Avraham Yitzhak Hacohen Kook (1865-1935): early religious Zionist; first Ashkenazi Chief Rabbi of Palestine. Tzvi Yehuda Kook (1891-1982): son of Rabbi Avraham Kook, succeeded his father as Chief Rabbi in 1935. Was spiritual father of Gush Emunim, a right-wing party which promoted Zionist settlement of the territories gained in 1967 war and opposed any withdrawal from those territories. Leon Pinsker (1821-1891): early Zionist theoretician, from Odessa, who wrote first Zionist pamphlet, Autoemancipation, in 1882 in response to the rising tide of antisemitism that produced a wave of pogroms in 1881-82. Baron Edmond James de Rothschild (1845-1934): French (Jewish) financier, who sponsored some Zionist projects. Chaim Weizmann (1874-1952): head of Zionist Commission from 1918, which worked with Great Britain to implement Balfour Declaration in Palestine. Later head of Zionist Executive, and ultimately first President of Israel. Emile Zola (1840-1902): French novelist, wrote tract defending Alfred Dreyfus. Joel Beinin's Stanford University Web Page.